"What, for the love of God, is a manburger? I Googled it, but I'm still not sure. It's either a geeky guy or a double cheeseburger with no condiments or extras. Simply meat and cheese. What's your definition?" Well, T. Douglas, thanks for asking. 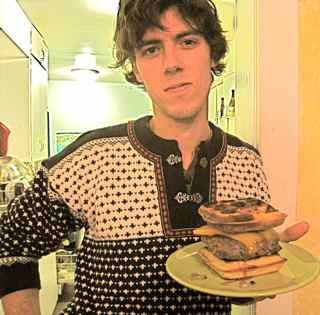 Manburgers are an important topic, being the staple food of a number of my close companions. According to T. Ellsworth, a Manburger is "a burger designed by men, for men. Except also by women for etc...." Concretely, the key element of the Manburger is the grassfed beef from which it is shaped. Contrary to popular belief, the essence of Manburger is not the stereotypically masculine consumption of animal flesh, but rather variety and creativity. Manburgers often incorporate "maternal" additions like green onions, chives, parsley, and shallots, or genderbending curry aoli and maple syrup. In the words of W. Crawford, "What's more manly than the empirical process of trial and not-error?" Let's consider one particularly stellar specimen of the manburger, the Belgian Waffle variant, pictured above in the hands of man W. Crawford. A good stove-top waffle maker produces a deeply-pocketed, crispy waffle -- a waffle with a shiny, almost glazed, buttery surface guarding a moist, tender interior. Just the thing to warm up later in the day as buns for your manburger. Note the slab of melting cheddar, added shortly after the manburger was flipped. A good dose of coarse sel gris added to the raw hamburger lent it a charming sparkle. And finally, a healthy trickle of bloody juices escaped the crispy seared surface of the burger, moistening the waffle and facilitating the marriage of burger and bun. In conclusion, T. Douglas, I would have to say that your first definition of Manburger is not so far removed from mine.